CONTRAST is a collaborative scientific project supported by the European Union for the "Cognitive Enhancement Training for Successful Rehabilitation After Stroke”. 2) They may have to deal with severe motor impairment. Both aspects may increase their dependence on other people, promoting feelings of lost autonomy and helplessness, and this often accelerates the development of depression. Early intervention to maintain or restore independence, which is linked to better well-being and overall management of daily life, is therefore of paramount importance! Unfortunately, a huge gap exists between institutionalized rehabilitation and management of stroke injured people in their home environments. Rehabilitation efforts mostly terminate abruptly on discharge, and so do efforts to monitor any changes in motor and cognitive function, daily life activities in social integration, health parameters (hearth rate), blood pressure and quality of life. CONTRAST will bridge this gap! Figure 1. 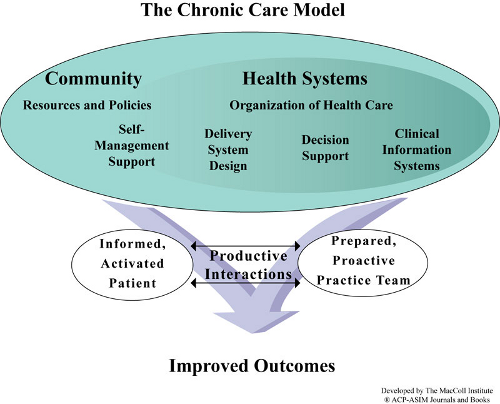 The Chronic Care Model requires that Community and Health Systems contribute to well-prepared practise teams and informed active patients who are in a productive interaction allowing for shared decision making on the cognitive training which has to be continuously adapted to the individual patient to be adopted. Improved outcome is demonstrated, for example, by increased self-efficacy, which is associated with low levels of depression and feelings of helplessness. Bridge the gap between the institutional rehabilitation and the continuous training and monitoring of the impaired function and the health parameters at home. Provide an adaptive human-computer interface (HCI) to improve the impaired cognitive function. This is achieved by the so-called neurofeedback training. The neuronal activity of the brain is recorded with EEG (electroencephlography) and fed back to the use in real time. This allows a person to learn how to alter the EEG which then can improve cognitive functioning. Figure 2. 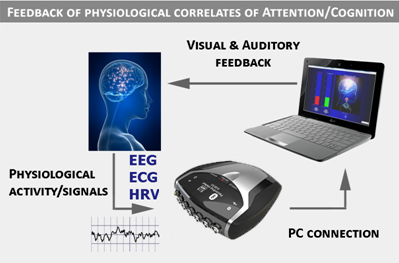 Implementation of feedback of physiological signals such as EEG (electroencephalogram), ECG (electrocardiogram) and for hearth rate HRV (heart rate variability) for improvement of general attention, memory and affective state. How will CONTRAST implement this? - The patient sets up a headset with electrodes, sits at home at the computer, while the doctor is in the clinic with a computer that is connected to the patient. - During the interactive session, the HCI sends information to the doctor. So, the patient and the doctor can interact. - On the basis of these data, the experts/doctors and the patient can share the decision on the training that should be conducted. Questions can be answered immediately. CONTRAST’s core interventions to improve the recovery after stroke are training modules, which address attention and memory. The affective state is also important target of intervention, since depression is frequent after stroke and hampers cognitive function, and functioning in daily life. Therefore, CONTRAST will provide accurate, adaptive, individually tailored interventions to improve both cognitive function and affective state. The CONTRAST solutions are based on sound medical and neuropsychological assessments and will help the expert and patient to work together to further develop the best training schedule. How can the patient benefit from the CONTRAST solutions? The HCI (Human-computer Interface) with cognitive training modules, and training to reduce depression. An individually tailored solution for applying these modules; this solutions can be discussed with the patient in a process of shared decision making. A test battery for measuring the training outcome at the behavioural (neuropsychological tests, activity measures, quality of life) and physiological level (heart rate variability, EEG). Once the product is on the market, the professionals will have the possibility to propose to their patients the participation in such a home training for a very individually adapted rehabilitation.